The catchment area of Castlemorton CE Primary School means we take pupils from Castlemorton and the surrounding villages of Birtsmorton, Golden Valley, Druggers End, Little Welland and Longdon. However parents who live outside the catchment area may apply and if we have space in the appropriate year group we can accommodate them. Our policy ensures that every application will be given fair consideration and is based upon criteria which are clear to parents. Worcestershire LA takes the responsibility for the admission and administration of all applications of pupils in all Community and Voluntary Controlled schools. 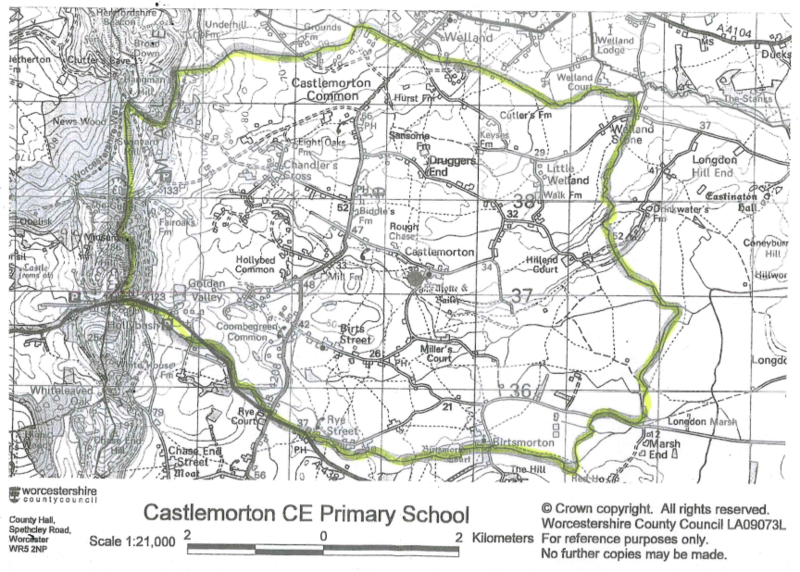 Currently the planned admission limit for Castlemorton is 15. If the applications exceed this, preference will be given as follows in accordance with LA policy. A child living in the catchment area. A child who would have a sibling attending the school at the time of both application and admission. A child with significant reason for admission to the school. This would probably be of medical, physical or social nature and would require a medical certificate and/or other supporting evidence. Parents who believe they have such reasons should inform the Worcestershire’s Education Office in writing at the time of application. A child who lives nearest the school by the shortest available walking route. *In accordance with legislation, a child with a Statement of Special Educational Needs will be offered a place at the school named on the statement. *Children who are looked after by the Local Authority have priority in each category of the criteria. In the event of there being too many applications from the catchment area, priority will be decided in the order indicated above for all the catchment area applicants i.e. children looked after by the authority first, siblings second, significant reasons third, attendance at a feeder school fourth then according to distance by the shortest walking route. If there are sufficient places for all catchment area applicants but insufficient for out of area siblings, priorities will be decided first by reference to any children who are looked after by the local authority , second to significant reason, third by attendance at a feeder school, then according to distance by the shortest walking route. The closing date for admission for 2019-20 is January 15th 2019. Please go to the website below to register.